We’re moving! In preparation we’re selling a few pieces from our collection. If you’re interested, send us an email and we’ll send you updates, item details & price list. We’re selling one of our presses, a few furnishings, and a couple other goodies that we’d love to find good homes for. This cabinet has been with us since beginning, and held our first fonts of hand set type. Manufactured by Hamilton Manufacturing in Two Rivers, WI. It comes with miscellaneous type and ornaments but most cases are empty. Looking for a good home where it’ll get used for type storage (priced for printing use, not antique shop pricing!). These stones are workhorses, and a necessity in any print shop. Wooden framed, storage underneath. Wooden letter board case used for storing galleys, rule, and wood type. Could be used to store paper, too. A fine double cabinet, offered with slant top composing surface. Cool little light fixtures could be restored to shine a light on what’s inside the cases! Type included in sale, some cases are empty. We’re going to be sad to see this press go. 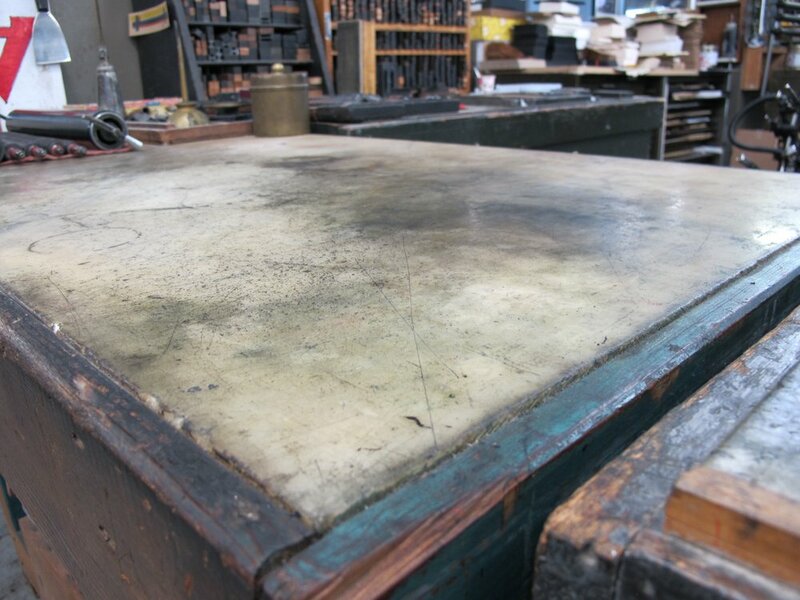 Over the last 20 years, this has been our favorite offset litho press that we’ve had on our floor, hands down. The swing gripper system, convex feed board with positive sheet transfer provides excellent registration. It can be run bearer to bearer, or variable/adjustable impression pressure. The construction of the solid iron frame provides what Heidelberg calls “no vibration” accuracy and consistency. It’s a beauty. We’ve printed much of favorite work on this machine, from single spot color to CMYK. LP jackets, oversized posters, oddball packaging jobs, art prints, broadsides, hairline five color spot jobs on 18 pt. folding board. If you work hard for this machine, it’ll work hard back. The offset K-lines were introduced in the early 1960s, with operating controls and a format that look very similar to the Heidelberg cylinder letterpress machines. Ours is from 1968. It’s in great condition, and is a pleasure to run. It comes with tools, spare blankets, extra plates & masking sheets, all the manuals, and a dampening roller cleaning machine if you need it. We’re hoping that this press will find a good home!! Please email if you’re interested in more information. Friends, it’s time to wrap-up Stumptown Printers, and call this adventure a success.